Manic Motherhood » Blog Archive » What am I? The maid? Do you see this picture? This? This is my downstairs bathroom. And this? 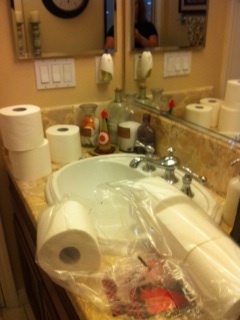 This is how I found said downstairs bathroom today, all covered in toilet paper rolls. Now I ask you? What the heck is that all about? Look, I spent most of the morning cleaning the house (and by “cleaning the house” I obviously mean “surfing the web for interesting recipes I will never cook”). Anyway, around noon I walk to the bathroom, to find the door closed. This is a bit perplexing. I’m the only one home, unless you count Kirby and No-no Lulu and while No-no Lulu has perfected the art of opening doors, she still doesn’t close them behind her. Anyway, so there I stood at the closed bathroom door, wondering if a burglar was in there using the facilities before he robbed me of my most prized possessions (um, that would be my iPad and…let me think…let me think…oh, pictures of Junior, of course). And that’s when it occurred to me. Probably nobody was in there (yeah, I’m really a blond in case that’s unclear). So I opened the door and found this. Who does this? I mean, first of all, this is a very poor TPing job. I have TP’d many, many homes in the past and I can tell you, it works out better if you unroll the toilet paper while TPing. Seriously. Who cares if someone leaves toilet paper rolls all over your lawn? To be honest, I’d be overjoyed. I wouldn’t have to buy Charmin for a whole week. Maybe even two weeks. But unrolled streamers of toilet paper? Oh, that’s a whole different ball of yuck. Looks like whoever used the restroom last, loaded up with toilet paper. And honestly, I don’t know why this offends me so much, except I do think it’s a giant slap upside my head. I mean, really? 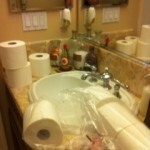 You just know whomever did this knew I would clean all the toilet paper up and put it under the sink where it belongs. 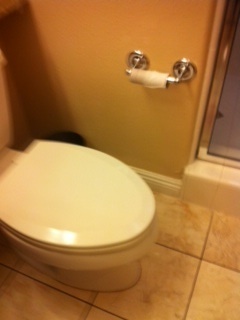 And even, AHEM, put a new roll on the dang toilet paper holder. So you know what? That person might be getting a home cooked meal tonight. Because in my house, nothing says, “don’t mess with me” like making Harry and Junior eat something I have cooked. 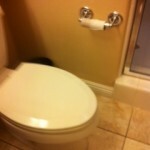 Like me on Facebook or I just might TP your house!